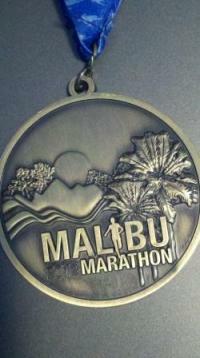 It was "one of those days" for me yesterday as I completed my 30th marathon at Zuma Beach in Malibu. The best part of the day was crossing that finish line! My official time was 3 hours, 17 minutes and 53 seconds, or about 18 minutes short of where I wanted to be. But, as Mick Jagger would say, you can't always get what you want! But I tried hard enough to get what I needed...which in this case was simply a finisher's medal. My strategy this race was to let everyone take off and battle it out, while maintaining a nice, easy 6:45 per mile pace. Wish my wife's bladder had gone off at 6 a.m. in hindsight. The marathon was supposed to start at 7 a.m., but one of the busses was late, so it didn't start until 7:35 a.m. - I hate when that happens. After the excrutiatingly longest (yet very well done) rendition of the national anthem I've ever heard, the race FINALLY started. I didn't see the first 3 mile markers but I felt as was going easy enough. But when I reached mile 4 I discovered I was at a 6:30 pace. By miles 7 to 10 I was feeling dried out. Mile 5-ish there were boxes of water and a table off to the side of a road, but no people to hand them out. Not good. Kind of like seeing a mirage in the desert. I guess maybe I didn't hydrate enough in the morning because I was completely parched by mile 7. Up ahead I saw a port-a-john and some people. All right, water, I thought. Nope, just some people cheering. Oh well, just wasn't my day. But thankfully a buddy of mine handed me some Gatorade later on. My body just wasn't up for the sub-3 hour challenge yesterday. Biomechanically, my lower legs were not up to the task. My feet hurt and my calves ached, and I was getting that "twinge" in my left calf that forced me to walk home on a long run 2 weeks ago. I had to play it safe and run flat footed most of the last 8 miles of the race. With one pit stop and 5 or 6 walk breaks, I pushed through the finish line in 3:17. That still got me 22nd overall out of 658 finishers. This was my 30th marathon and 2nd slowest ever. The only time I ran slower was in 2002 at the Sunburst Marathon in Indiana, where after taking a wrong turn with other runners, I backtracked, injured myself and walked to the finish in 3:30. That said, I still was really happy to finish yesterday. Just "one of those days" indeed! There's no doubt in my mind that I could run a sub-3 marathon with my recent 1:24 half marathon time. Self diagnosis tells me that my body had not recovered from the half marathon (3 weeks ago) followed by the long run the weekend after. And that was preceded by a 5K, 2 long runs, another 5K, 3 long runs and a 25K race, in reverse order. My calves were screaming for relief after the half marathon and I ignored them, choosing to "squeeze in" one last long run, where my strained calf made it clear that my body needed more recovery, not more mileage. Enough about ME already! John Fedoroff of our own Thousand Oaks demolished the course record in 2 hours, 37 minutes! To my knowledge he's the only person that has run sub-2:40 on this course! John had planned to run the New York Marathon that was cancelled after Hurricane Sandy hit. John previously ran a 2:34 at the 2011 Boston Marathon. Only 6 runners managed to dip below 3 hours yesterday, telling of the challenging nature of the course. Benjamin Atkins of Westlake Village was 4th place overall in 2:53. Steve Smith of Newbury Park, top finisher in the 50+ age category, came in 10th overall in 3:07:56. Nice job! And getting back to me again to finish this out...the good thing about this marathon for me, other than finishing, is that I'm only moderately sore today. That means quicker recovery and time to start pondering my next running adventure!